Well my pretties, it has been a while. Please forgive the decided lack of posts the last couple of months, I promise to do better! Life got in the way of my blogging, and by life I mean our oven blew up. It seriously did. Scuba was cooking one night and BAM! The fuses were blown and so was the oven. It’s ok, I had it fixed and it is working again. Then the air con decided to start leaking.. It is also repaired. I tells ya, it never rains, it pours. VARIATIONS: This recipe can be fiddled with if you can’t find beef cheeks. Any cut of lean beef that is suitable for stewing, like chuck steak, brisket or gravy beef should be fine. Also, you don’t have to use red wine. Beef or chicken stock will be fine. I used chicken stock so that the red capsicum would shine through. If you don’t want to use asparagus, green beans are also nice. GLUTEN FREE SUBSTITUTIONS: Choose a gluten free pasta or rice to serve. Use home-made chicken stock in lieu of store bought or bouillon cube or just use water. Begin by making a mirepoix – a French term for an aromatic mixture of onion, celery and carrot that is diced finely and sweated off in some olive oil. I also added a pinch of salt and a couple of grinds of black pepper at this point. To this, we will add garlic and the first 2 red capsicums, also finely diced. We will continue to sweat the vegetables off in the oil until the onion becomes translucent and some of the lovely red from the capsicum leaches out and makes the onion turn a faint yellow. This should take about 10 minutes. Now, push the vegetables to the edge of the pot and clear a space in the centre to brown our meat. Turn the heat to a medium-high heat and brown the meat for about 5 minutes on each side, being careful not to burn the vegetables. Once nicely browned, add the wine and the stock and bring to the boil. Cover and reduce heat so that the pot id gently simmering. Simmer for two to three hours, or until the meat can be easily shredded. You may need to top up the the pot with water , so check the pot every 30 minutes to every hour, I found that I needed 1 cup of water every hour to stop the pot from boiling dry. Once the meat is ready to be shredded, remove from the pot and keep warm. Add the remaining red capsicum to the pot, and simmer gently for 45 minutes. I know, I know, there is already red capsicum in the pot, but we are trying to amp up and enhance the capsicum flavour. Plus the sauce will have a more vibrant red colour by adding capsicum later in the cooking. You may wish to simmer with the lid off as we are trying to create a thick sauce of between 2 to 3 cups volume. You can drain off some of the cooking liquid if you have too much or you could prepare a double lot of the capsicum sauce and freeze the extra, it makes a luscious soup especially with a dash of cream. While the capsicum is doing its thing, shred the meat. I did this with my fingers (which were clean!) as this meant that when I was finished, any meat that ‘fell’ off the chopping board was fair game. 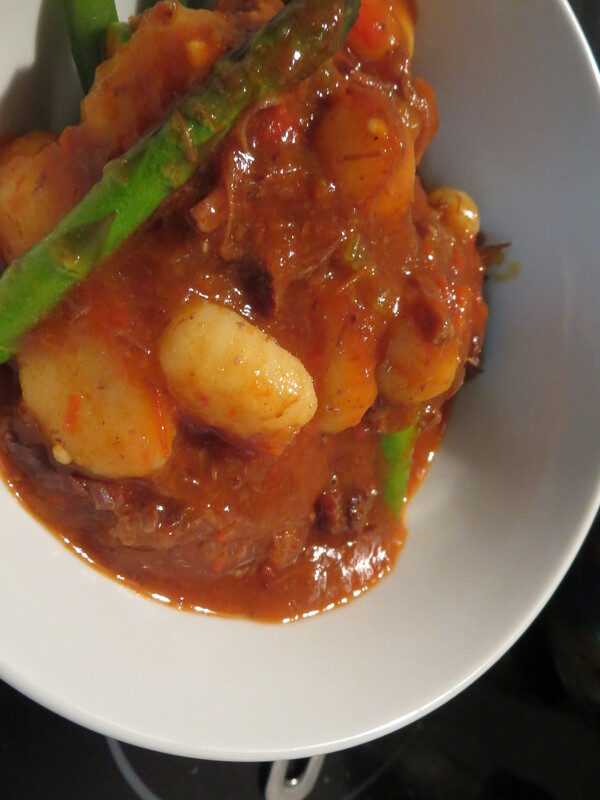 Also, prepare your asparagus and pasta, I had gnocci with mine which only takes 2 minutes to cook! Once you have the capsicum nicely cooked and it is at the right volume, get out your trusty stick blender and blitz away. I like mine fairly fine so I blitzed until there were no chunks. Look how pretty it is. If you are being super fancy, you could strain the capsicum sauce through a muslin cloth. Return the meat to the pot with the asparagus. Check the seasoning and adjust if needed. After 2 minutes on a low heat, add the gnocci (or pasta of your choice) to the pot and stir. Serve with crusty bread and a glass of the leftover wine. Yummy. Heat the oil. Add the onion, celery, carrot salt and pepper. Stir, then add the capsicum and garlic. Let cook on a medium heat until onions become translucent, stirring occasionally. Move the vegetables to the edge of the pan, turn up the heat and add the beef cheeks. Brown the cheeks for about 5 minutes on each side, being careful not to burn the vegetables. Once the meat is browned, add the wine and the stock to the pan, brig to boil , then reduce heat to a simmer. Simmer, covered, for 2 to 3 hours, topping up the liquid in the pot with water as needed every 30 minutes to stop the pot running dry. When the meat is easily shredded, remove it from the pot and keep warm. Add the extra capsicum to the liquid in the pot and simmer until tender, from 30 to 45 minutes depending on the size of the pieces. You may wish to simmer the capsicum uncovered to reduce the cooking liquid, as we are aiming for about 2 1/2 cups of capsicum purée to plate up with. While the capsicum is cooking, shred the meat, prepare the asparagus, and get the water boiling for your pasta of choice. 5 minutes before the capsicum is ready, start cooking your pasta. Once the capsicum is cooked, blend it with the mirepoix and enough cooking liquid to make up to about 2 1/2 cups of sauce. Reintroduce the beef cheeks into the sauce and add the asparagus. Check for salt and pepper and add extra to taste if needed. Cook at a simmer for 2 minutes, just long enough to heat the meat thoroughly and to just cook the asparagus. Add your pasta of choice to your sauce, stir and serve. Enter your email address to follow Vanilla Spiced Lullaby and be notified of all my latest recipes by email.